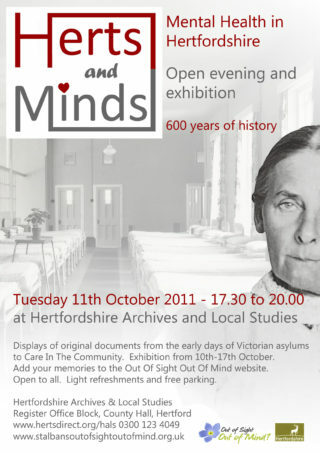 Herts and Minds | Events | Out of Sight, Out of Mind? Aspects of Hertfordshire health care over the centuries will be examined in an exhibition at Hertfordshire Archives and Local Studies on Tuesday 11 October 5.30 – 8pm. Original documents relating to Hill End and other hsopitals will be on display. There will be a talk by Chris Tutton entitled ‘Poetry as Healing’ and representatives from MIND will be attending to explain their work. This page was added on 29/09/2011.